Sonya Heleno loves to fight. She holds a black belt in karate, earned in a club in her hometown of Shelburne. She admits she gets a "thrill from fighting, even though I do both the traditional and sport aspects of karate. I want to do (fighting) tournaments next year but I’m not sure if I’m good enough, even though my instructor says I am." But Sonya is a fighter in other ways, too. Soon to enter Dalhousie University on a TD Canada Trust 2007 Community Leadership Scholarship, the 18-year-old has fought for human rights for a few years, creating a program called Kits for Kids. "I read in the Chronicle Herald about Sleeping Children Around the World, a Canadian organization that provides the bed kits for children in third world countries," she says, eyes wide with excitement as she describes what the organization does with $30 per child that goes, totally, with no administration costs, to providing for these children. Last June, Sonya travelled to Togo in West Africa, at her own expense and without the benefit of a tax receipt, to personally help deliver the bed kits to kids. Each kit consists of a mat or mattress, pillow, sheet, blanket, mosquito net (if applicable), clothes, towel and school supplies. Contents vary from country to country, depending on local needs. Bedkits are made in the countries where they are distributed. Locally produced bedkits result in elimination of transportation costs, provision of materials and labour at minimal cost, employment for families and assistance to the local economy and the country. "There were six of us on our team in Togo," says Sonya. "There are hardly ever any youth. The next youngest to me on this mission was about 45." Overseas volunteers led the team to local villages where they saw great poverty. "It was very sad to see," she says. "On television, it doesn’t seem real, but when you’re there and it’s in your face, it doesn’t seem right that it happens." The reality of poor children is why Sleeping Children Around the World was started by Murray and Margaret Dryden, parents of hockey goalies Ken and Dave, in 1970 after travelling through India and seeing children sleeping on the street. During the depression in the 1930’s, Murray traveled east from Manitoba looking for work and endured many nights without food or a bed. He later said the comfort of a bed is a basic right of every child and that there is nothing more peaceful than a sleeping child. His hobby of photographing sleeping children (his own and those of friends) gave rise to the idea of a retirement project. He and Margaret decided to provide bedkits to 50 children in India in 1970. The concept grew and eventually became the focus of their lives. Almost 700,000 kits have been distributed. Sonya is glad she found the idea. "Now that I’m home and into my old routines, I still stop and think how comfortable we are." She thought about that before the Togo trip and spent her own dollars at used clothing dealers to leave outfits with children in Togo. "The bed kits are for children ages six to 12 who are living with their families, not to be given to street kids, for they’ll probably be sold, certainly not the purpose. The clothes I took were for teenagers who had little of their own." She raised funds for the $30 kits by canvassing schools and running dance coat checks at Shelburne Regional High School. In 2006-07, Sonya co-chaired the school’s Stop Poverty committee which ran a 30-hour Famine, generating $2,300 for World Vision. She had earlier organized one in Grade 8. "We have so much," she states. "We all spend money on things we don’t need. It only costs $5 a year to send a child to school in Togo and, do you know, two-thirds of the population can’t afford to send their kids?" Now that high school is over, Sonya says this won’t be the end of her charitable work. "I want to organize something in university to raise money to help kids. I’m very excited to meet more people who want to do that sort of thing." This young woman is not singularly focused. She played soccer on Shelburne High’s division III provincial championship team, "the most incredible thing ever, the best moment of my senior high years when we won." She was an air cadet for four years and, as a flight commander in her last year (summer between Grades 10 and 11), was named top cadet at camp in Greenwood. But it’s Togo that’s leaving a lasting impression as she looks at a career in either medicine, psychiatry or international development — or maybe a combination of all three. "I realized, as did the Drydens, that if a child is hungry, sore and tired, a good night’s sleep can prepare him or her for the next day. They need that to fight the hunger and the pain. I hope was able to help by providing the Kits for Kids." It’s time for a brief vacation. Great Kids will return August 26. Contact Joel Jacobson via e-mail at jjacobson@herald.ca or fax at 426-1158, or phone 902-426-2811 ext. 2222. We might describe Togo differently. Warren reported that the average daily income in the rural areas is near $1.25 a day while the income in the more populated areas is near $3.25 daily. While fruits and vegetables are plentiful and inexpensive by our standards, most local residents can not afford to buy them. The main city in Togo is called Lome and it is choked with people. Many are trying to create small businesses to make a meager income. On a small table, Warren observed old whiskey bottles full of diesel, gas or motor oil. This was a crude Togolese gas station!! SLEEPING CHILDREN AROUND THE WORLD was registered as a Canadian Charity in 1970 by Mr. Murray Dryden and his wife Margaret, parents of legendary hockey stars Dave and Ken Dryden. To date, this unique Charity has raised in excess of 20 million dollars and distributed bedkits to 888,350 children in 32 different third world countries. SLEEPING CHILDREN AROUND THE WORLD works with reliable overseas partners who arrange for all items to be made locally and assist in the selection of the neediest children. Our overseas partner in Togo is “Action Enfance et Developement Togo”. Clarence Deyoung, a resident of Halifax, has witnessed this many times before in other countries that he has visited. At first the caregivers do not believe that an act of charity will occur for them. These people have often had promises made to them, but never fulfilled. But when the day arrives for the Canadian team to visit their village, their disbelief is replaced with joy! Clarence and a team of Canadian volunteers recently completed the very first distribution of 3000 bedkits in Togo on behalf of a Canadian charity, Sleeping Children Around The World. This is a country in great need. In a country where malaria is rampant, when parents were asked if they had mosquito nets for their children, not one hand was raised. The parents were in awe at the sight of the children walking away with their bedkits on their heads – including a long lasting insecticide impregnated mosquito net. Clarence and his team represented an exemplary Canadian Charity called SLEEPING CHILDREN AROUND THE WORLD. This charity pledges to its donors that every penny of a $30.00 donation will be invested in the bedkit. The team that traveled to Togo paid all of their own expenses. Murray and and Margaret Dryden, parents of legendary hockey legends Dave and Ken Dryden, registered this Charity in 1970 and to date this unique organization has delivered a total of 888,350 bedkits to needy children in 32 different third world countries. For more information please contact Tamara Kaftalovich, Consultant, Maverick Public Relations Inc. @ 416-640-5525 ext. 234. The respected Canadian Charity, SLEEPING CHILDREN AROUND THE WORLD, recently completed a distribution of 5,000 bedkits in the Philippines. As with any distribution, there are memorable events that occur making each exercise very special. One such event occurred in Polangui! Mr. Ken Graham has served as a travelling volunteer for SLEEPING CHILDREN AROUND THE WORLD for many years. This year as he travelled to the Philippines he was very happy to have his daughter, Elaine McDougall as a member of the team. In Polangui, the Canadian team was assisted by a number of local volunteers. One of the eager helpers was a young man who worked tirelessly to ensure that the Canadian Team always had water on hand. In the extreme heat of the Philippines this act of kindness is essential to the success of the distribution. When the distribution was completed an inquiry was made to determine if there was anyone present who may have received a bedkit in a previous distribution. One person stepped forward. It was the 16 year old water boy! In the conversation that followed, it was discovered that this young man had received his bedkit 10 years earlier and the man who had placed it in his hands was Ken Graham! SLEEPING CHILDREN AROUND THE WORLD is an exemplary Canadian Charity which from its inception in 1970 has delivered 888,350 bedkits to needy children in 32 different third world countries. Its founders, Murray and Margaret Dryden, parents of hockey legends Dave and Ken Dryden established this Charity in such a way that 100% of all donations go directly to the bedkit. The Toronto Star recently listed this Charity as among its top five! For more information please contact Tamara Kaftalovich, Consultant, Maverick Public Relations Inc. @ 416-640-5525 ext, 234. The day could not have been more beautiful. 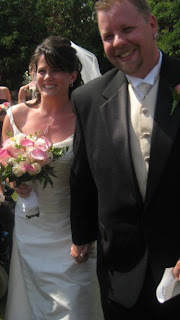 On July 7, Meghann Clark and Sean Gilpin exchanged wedding vows in the presence of family and friends. It was a day for new beginnings and celebration – not only for a special couple in Canada but also for 15 very needy children in Africa. A brief reception followed the ceremony and then the guests were invited to enjoy a sumptuous dinner. Each beautifully appointed table contained a magnificent floral centerpiece and a picture of an African child. These pictures represented a very unique expression of love. Each of the children in the pictures had received a bedkit as a result of the generosity of Meghann and Sean. For the very first time these children would experience the joy of a peaceful night’s sleep on a proper mattress. Leslie Banner speaks passionately about SLEEPING CHILDREN AROUND THE WORLD. In June, she was part of a team that distributed 6,000 bedkits in Uganda. Fifteen of these bedkits were presented to children in recognition of the special vows that were to be exchanged by Meghann and Sean. 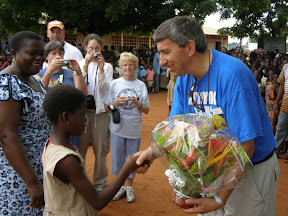 This was Leslie’s 6th distribution trip to this Central African country. In that period of time she has personally touched the lives of 35,000 children. She has seen a beautiful country that is burdened by poverty and disease. She understands the ravages of HIV/AIDS. She also understands the true expression of love when a child receives a bedkit because someone made a donation of $30.00. She has developed a profound affection for Uganda – particularly for the children whose lives have been changed with the receipt of a bedkit. SLEEPING CHILDREN AROUND THE WORLD was registered as a Canadian Charity in 1970 by Mr. Murray Dryden and his wife Margaret, parents of legendary hockey stars Dave and Ken Dryden. This Charity prides itself in the fact that every penny of each donation is spent on the contents of a bedkit. Volunteers who travel on behalf of this unique Charity pay their own expenses! Recently the Toronto Star listed SLEEPING CHILDREN AROUND THE WORLD as one of the top five charities in Canada!